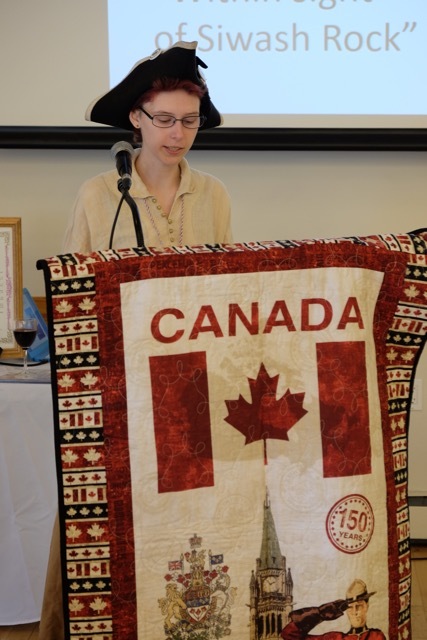 To celebrate Canada 150, the UELAC Vancouver Branch decided to appoint a Poet Laureate to the Branch. Kirra Little UE is a proven descendant of Loyalist Samuel Atkins. To date she has written poems for BC Loyalist Day, Remembrance Day, and a new Loyalist Prayer for our 2017 Pacific Regional Canada 150 Celebrations. for details, click here or on the image at right. Moving Ever Westward: Loyalist Descendants in British Columbia. 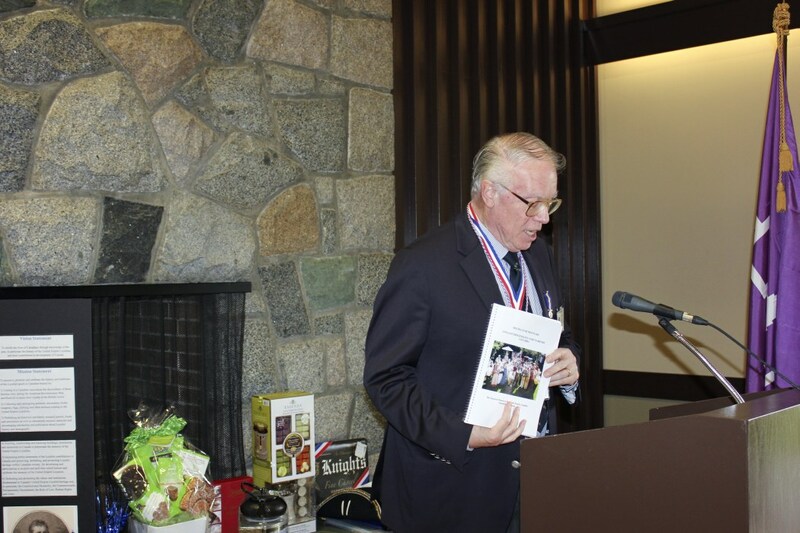 Editor and compiler Dr. Peter Moogk, UE, launched the book Moving Ever Westward: Loyalist Descendants Come to British Columbia at the centenary event, which was attended by Dominion President Bonnie Schepers, UE, and her husband, Albert Schepers, of the Bicentennial Branch in Ontario. The event also marked the Fall Fleet arrival of loyalist ancestors to Parrtown, Nova Scotia (now Saint John, New Brunswick) in 1783. Members and their guests attended from all four pacific regional branches, as well as two members of the Sir Guy Carleton Branch, Mr & Mrs Syme who were in attendance to see their son, Vancouver Branch member, Jeff Syme receive his UE certification. During the book launch, Dr Moogk made a special presentation of two books to the Dominion President. One copy for her own personal use, and a second copy for the Dominion Library in Toronto, Ontario. The Vancouver Branch is proud of its latest completion of its second 2014 project and thanked Dr Moogk for his guidance and expertise in completing this project. Vancouver Branch was treated on Tuesday evening 16 September to its third annual programme of BC Heritage Fair Presentations. 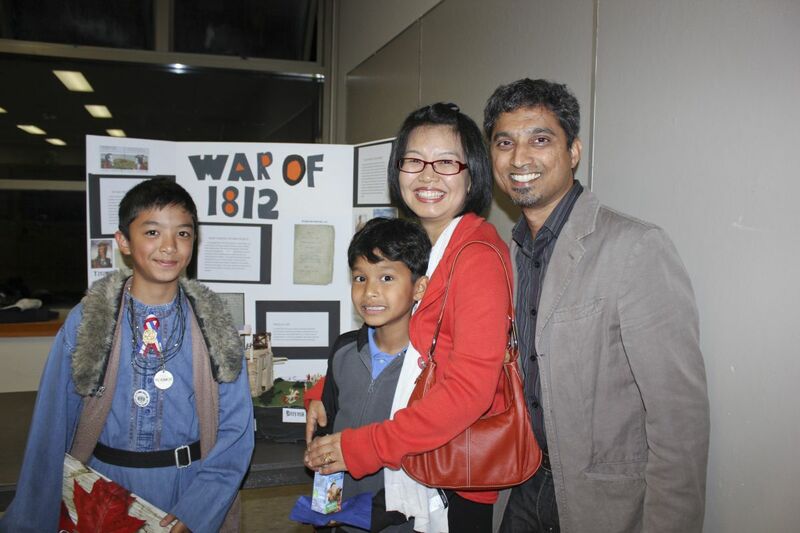 Four excited and keen students came with their parents and families to hear the winning students of the 2014 UELAC Vancouver Branch Award held in local schools in March, April and May. This year, the Vancouver Branch presented fifteen, "THE LOYALISTS: Pioneers and Settlers of the West, A Teacher's Resource" books to participating teachers in the Vancouver School District. The branch also invited Janet Morley to our meeting. Janet is the Vancouver School District Co-ordinator for the BC Heritage Programme. 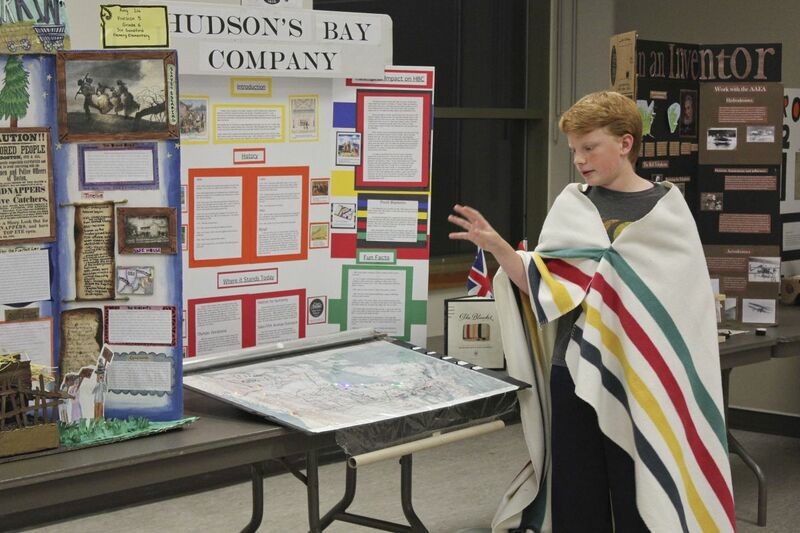 Hudson's Bay Company, by Fritz R.
Freedom Train: Underground Railway, by Amy L.
War of 1812, by Serome K.
Alexander Graham Bell: More Than an Inventor, by Farbod N.
All of the presentations were well researched, informative, and interesting. 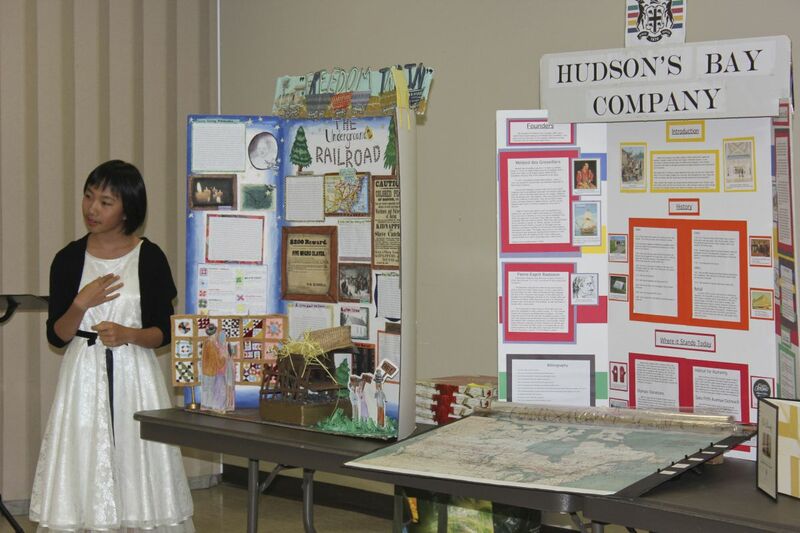 Students presented their critical thinking project boards and spoke well of their research. Each student also must complete a written as well as a creative component. 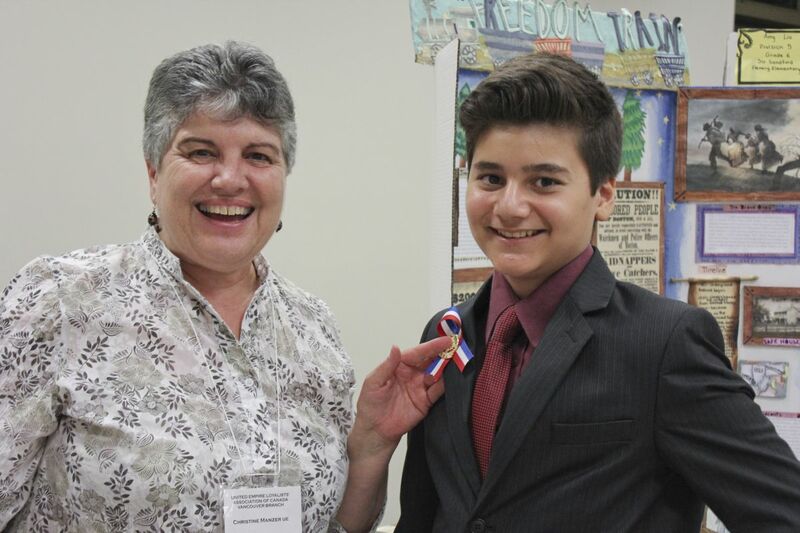 The students, familiar only with giving these presentations on a "one-on-one" basis with their respective adjudicators during the Heritage Fair did a great job of speaking in front of such a large group. 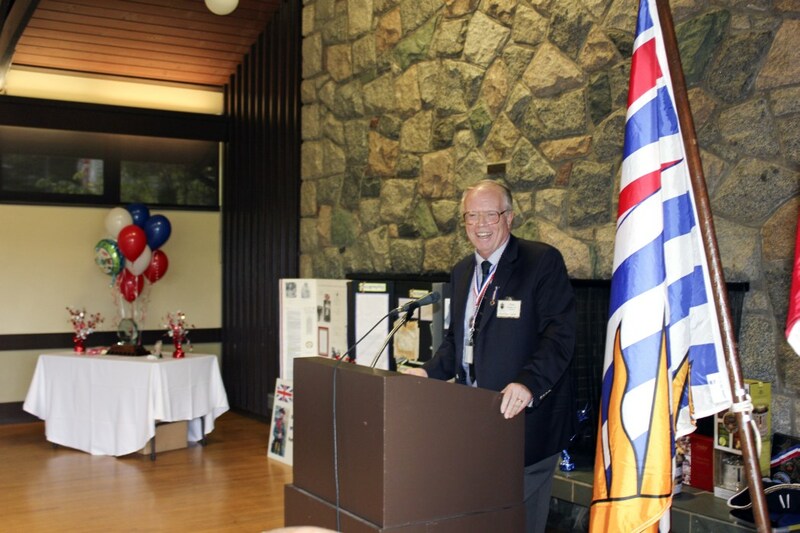 Past President and Vancouver Branch Co-ordinator for the BC Heritage Fairs, Carl Stymiest UE chaired the programme. 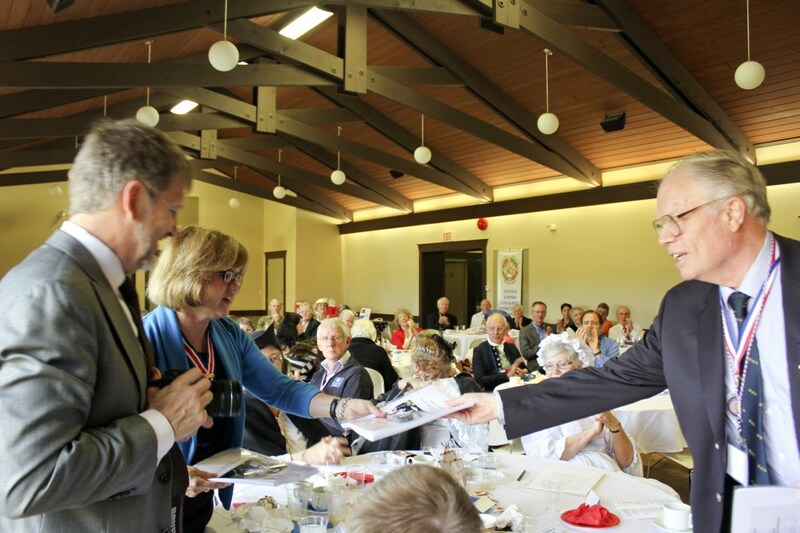 Carl along with Vancouver Branch President Gwen Dumfries UE and Christine Manzer UE, presented each of them with a CANADA book, a UEL ribbon and George III Cypher pin, a Certificate of Excellence and a 1914-2014 UELAC bookmark. 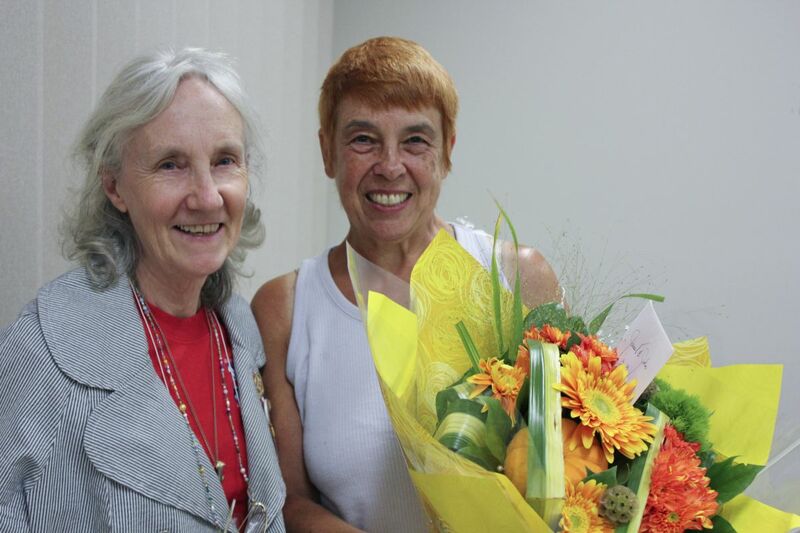 Mary Anne Bethune UE thanked the Heritage Fair students and the District Co-ordinator, Janet Morley and presented her with a bouquet showing our Appreciation. Light refreshments and "goodies" followed the programme while the members talked with students and their families. This yearly event is one of the most rewarding "Outreach & Education" programmes that the Vancouver Branch UELAC holds. We look forward to the 2015 projects as adjudicators. We also wish to thank the UELAC Dominion Grants Committee for supporting the Vancouver Branch in this educational endeavour. Vulcan Enterprises Ltd., North Vancouver, B.C. 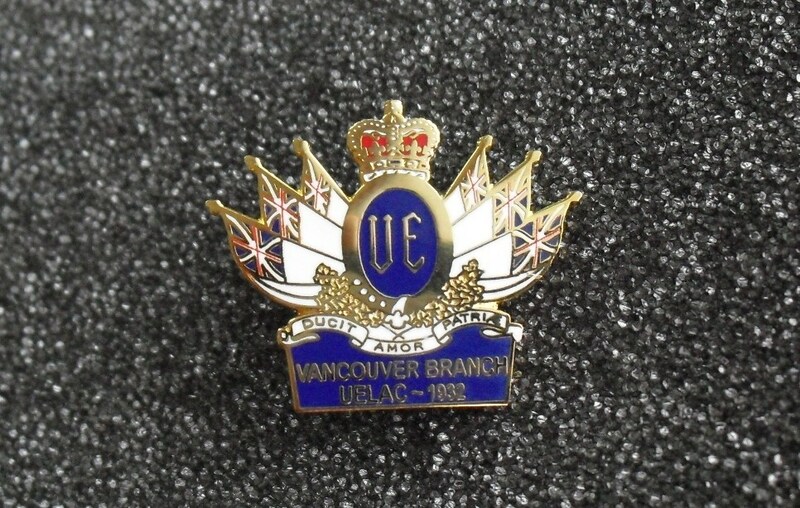 A new Vancouver Branch UELAC Pin is available. 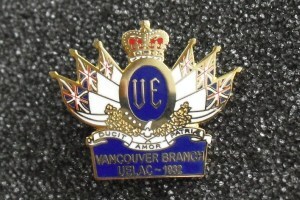 The Vancouver Branch Pin Order Form is posted online. This book will be an anthology of personal stories, each 3-8 pages long, that will briefly identify the Loyalist ancestors of that individual or family and will trace the migration that brought their descendants to British Columbia. The focus will be on the final move. This will be a contribution to the history of internal migration within Canada and will help identify the motives that impelled people to travel westward to the country's Pacific Coast province. The contributions will be grouped according to the time period in which the individuals came to B.C. For example, the famous explorers Alexander Mackenzie, Simon Fraser and Peter Skene Ogden-all of Loyalist stock -will be placed in the first section titled "The Age of Exploration and the Fur Trade, 1740-1857." The Mining Era (1858-1914) will provide the next section. Because this province has depended on the export of natural products for distant markets, the organizing structure is based on the successive export staples that have dominated British Columbia's economy. Each of the five sections will have an introductory essay summing up the dominant trends and principal events of that period. In this way, the personal accounts that follow will be provided with a historical context. At the AGM and Regular meeting of the Vancouver Branch 15 January 2013, out-going branch president, Carl Stymiest UE presented to the branch a flag of The Six Nations (Haudenosaunee [Iroquois] Confederacy Flag) donated by David Kanowakeron Hill Morrison UE as a 80th Anniversary gift of the founding of the Vancouver Branch in 1932. A letter from David was read to the membership and received with resounding applause. David explained in his letter the significance of the flag and its symbols. The Vancouver Branch will proudly display the Six Nations Flag alongside the Canada, Loyalist and Provincial flag during our formal and outreach and education events. Niawen (“nay-way”) – thank you, David.